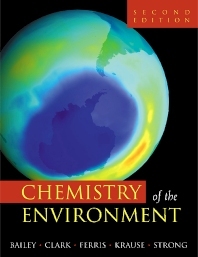 Emphasizing new science essential to the practice of environmental chemistry at the beginning of the new millennium, Chemistry of the Environment describes the atmosphere as a distinct sphere of the environment and the practice of industrial ecology as it applies to chemical science. It includes extensive coverage of nuclear chemistry, covering both natural environmental sources and anthropogenic sources, their impacts on health, and their role in energy production, that goes well beyond the newspaper coverage to discuss nuclear chemistry and disposal in a balanced and scientifically rational way. This is the only environmental chemistry text to adequately discuss nuclear chemistry and disposal in a balanced and scientifically rational way. The overall format allows for particular topics to be omitted at the discretion of the instructor without loss of continuity. Contains a discussion of climate history to put current climate concerns in perspective, an approach that makes current controversy about climate change more understandable. Upper undergraduate and graduate level students studying environmental chemistry, chemical engineering, industrial ecology, and general biology. Rensselaer Polytechnic Institute, Troy, New York, U.S.A.
"This is a timely work with political overtones, rigorously treated topics, lavish data, adequate illustrations (including colour plates), some gems of information, high drama and occasional dark humour.